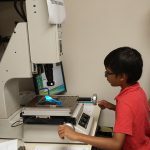 Durham and Raleigh NC, 8/23/2014 – Nearly two dozen fourth through eighth graders got a jump start on their careers at STEM For Kids’ Engineering Days camp in Durham. Created in collaboration with Gilero Biomedical and Kenan Fello ws Program , the program aimed to encourage children to pursue STEM careers. See complete news story here.